What could be better on a beautiful day in San Diego California? Excellent food, great music, and all the fun of SeaWorld rolled into one special event. 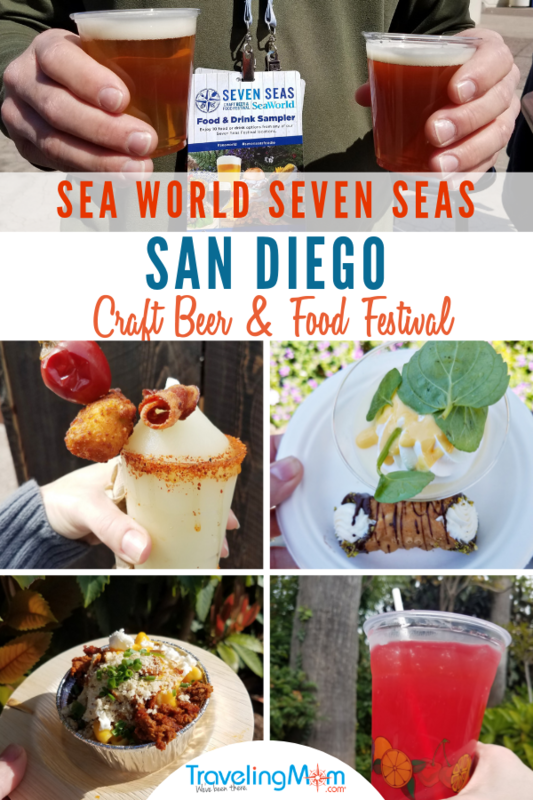 It’s the annual SeaWorld San Diego Seven Seas Craft Beer and Food Festival, taking place each Saturday and Sunday from March 9-April 28, 2019. Our Day Trips TravelingMom has attended the event since its inception. She says it’s a SeaWorld San Diego highlight, before the big summer crowds kick in. Admission to the event is included with regular park tickets, but food and drink tastings are an additional charge. Festival activities begin at 11 am and last until the theme park closes. 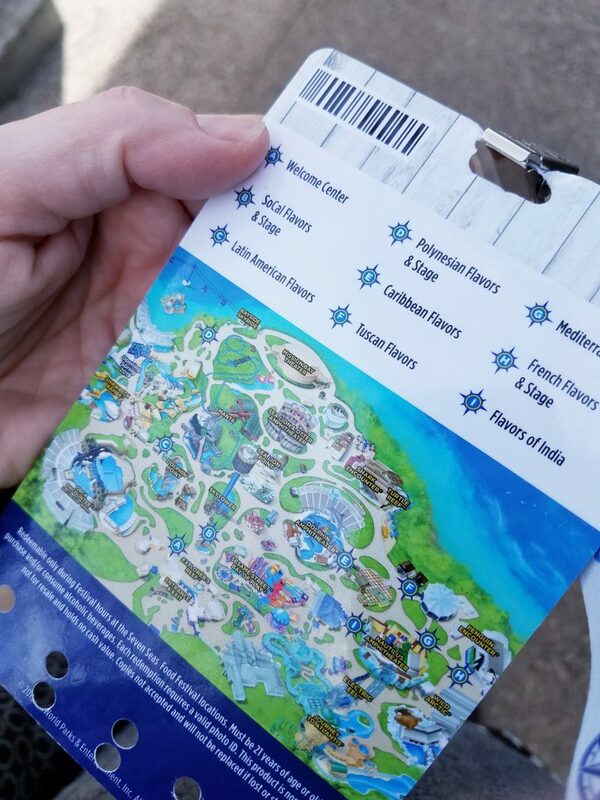 If you’re going to visit SeaWorld during the spring time, read on to learn what you need to know about this annual event. Disclosure: The writer was hosted by SeaWorld to allow her to gather the information for this post. And the post contains affiliate links. If you click through and buy, TravelingMom will receive a small commission at no additional charge to you. 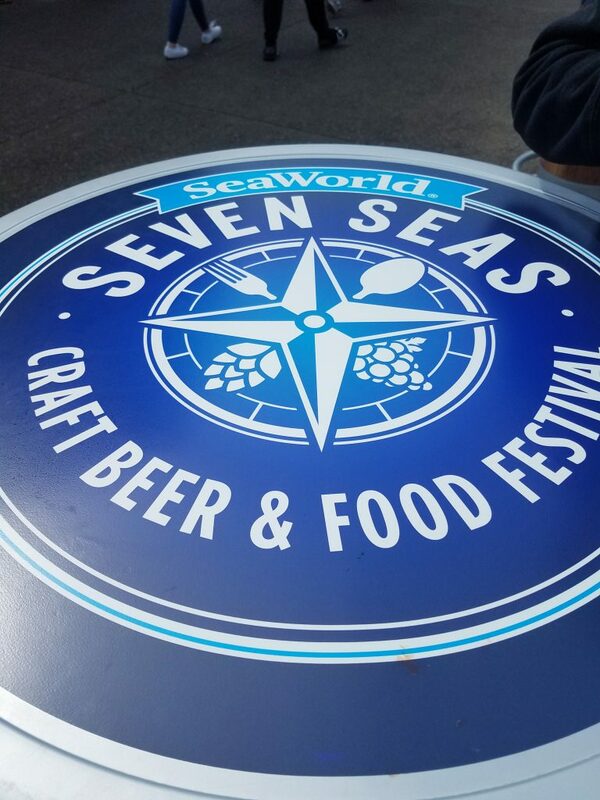 What is the Seven Seas Craft Beer and Food Festival at SeaWorld San Diego? Sea World San Diego Seven Seas Food Festival is a blend of high-end cuisine, music and beverages inspired by dishes from across the seven seas. 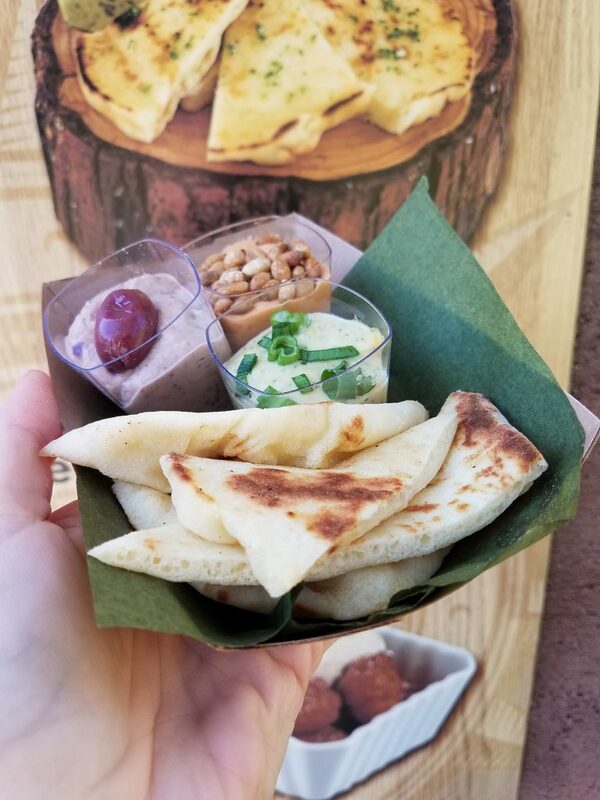 The ambitious appetizers were created by SeaWorld’s executive chef, Dave McHugh, and his culinary team. In addition to the 33 new flavors this year, there are specialty cocktails and more than 125 craft beers. 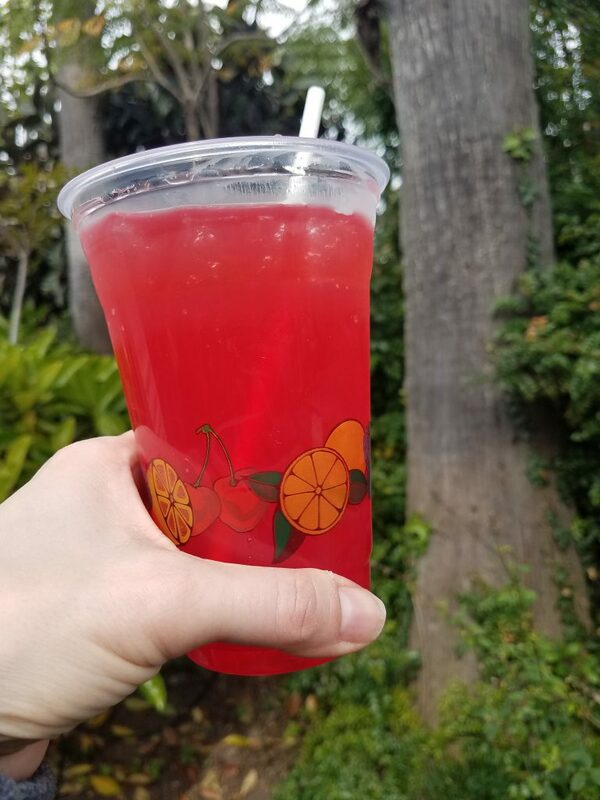 There are 8 “flavor” locations at 14 dining kiosks spread around the theme park. In addition, there are dedicated craft beer hubs with a rotating slate of craft breweries each weekend. Event guides are available at each location and include a map showing where to find each dining kiosk. TravelingMom Tip: Buy your SeaWorld park admission tickets ahead of time at a discount through Undercover Tourist. 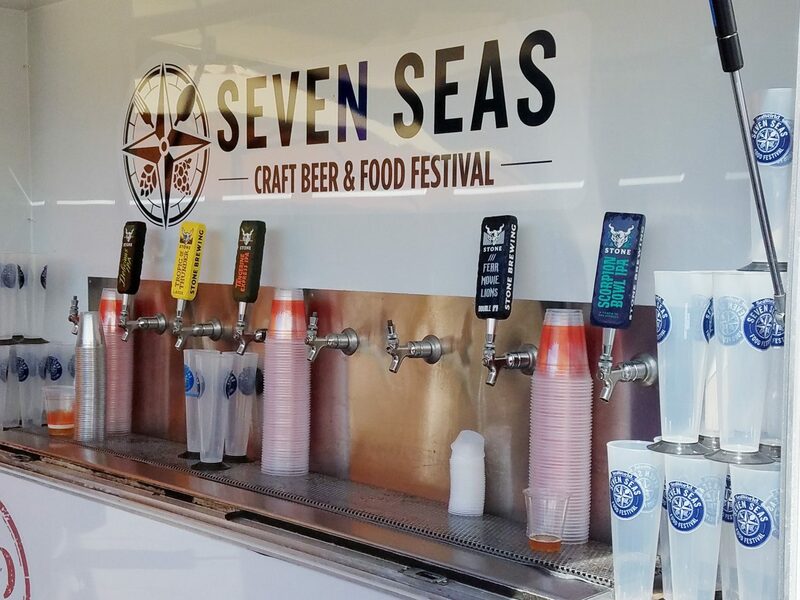 Seven Seas Food Festival purchases are a separate charge. You can choose to pay for items individually at each kiosk or purchase a Tasting Sampler. 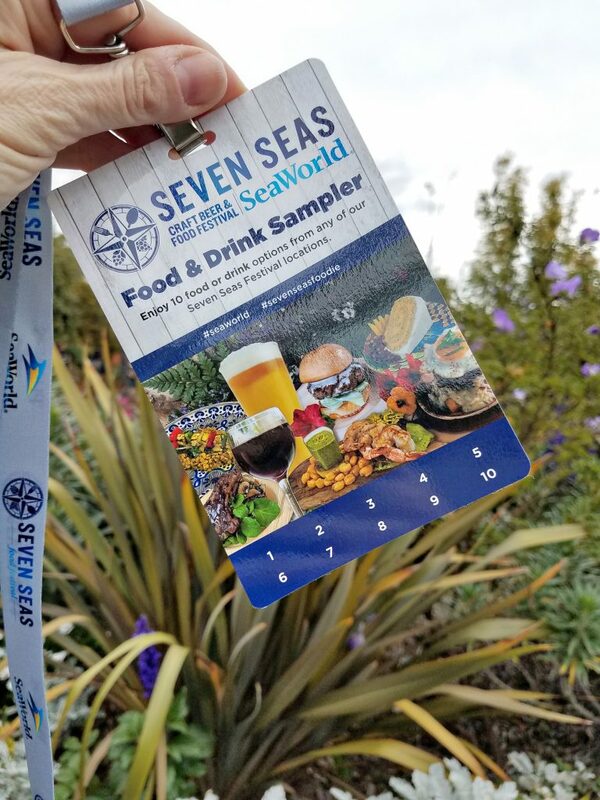 The sampler cards are on sale at the SeaWorld Welcome Center. There are two sampler options. Purchase a 10-item food & drink sampler for $50, or a 15-item lanyard for $65. You’ll receive a punch card with a lanyard that can be used at any of the 14 kiosks. One purchase equals one punch on the card. The backside of the card has a map and key to help you find each of the dining locations. 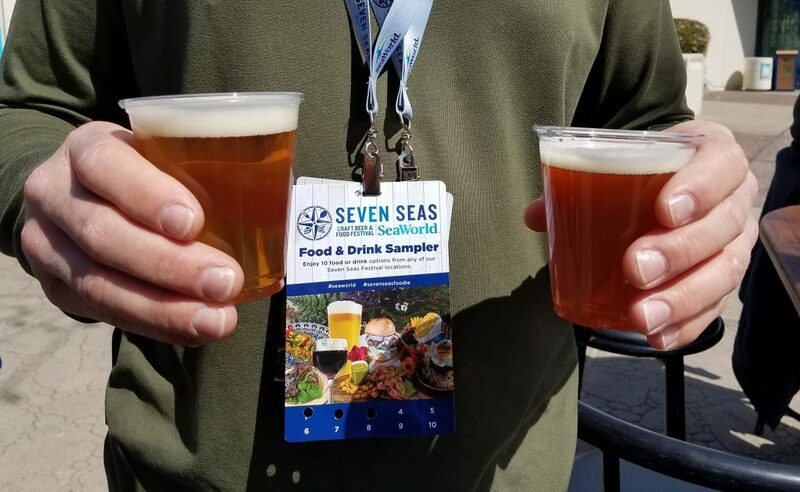 SeaWorld Pass Members receive a 10% discount at all dining locations offering sample-sized food, wine and beer tastings. I’ve always thought the food at SeaWorld San Diego is top-notch for an amusement park. 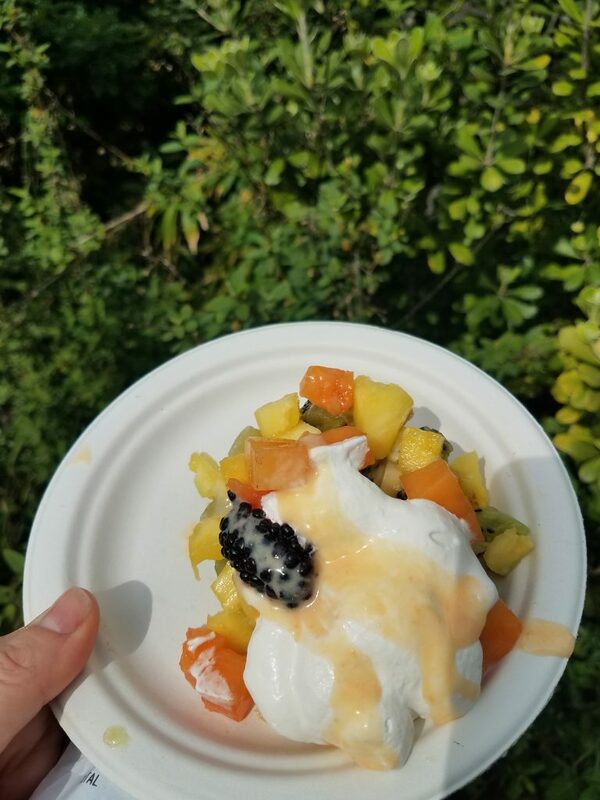 On a previous visit, my family attended Dine with Orcas, where we enjoyed sustainable fish, Swedish meatballs and a wonderful dessert bar. 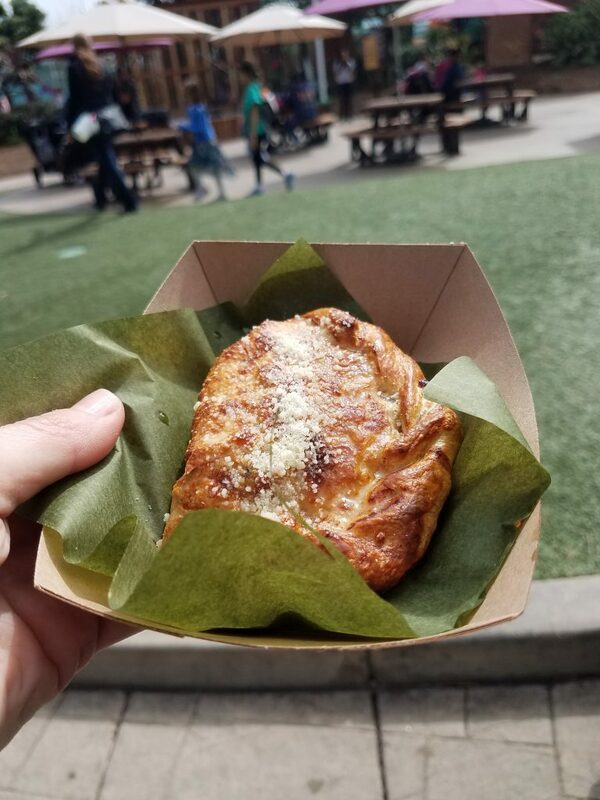 SeaWorld San Diego serves food that is decidedly “un-theme park.” These gourmet offerings contain sustainable ingredients. 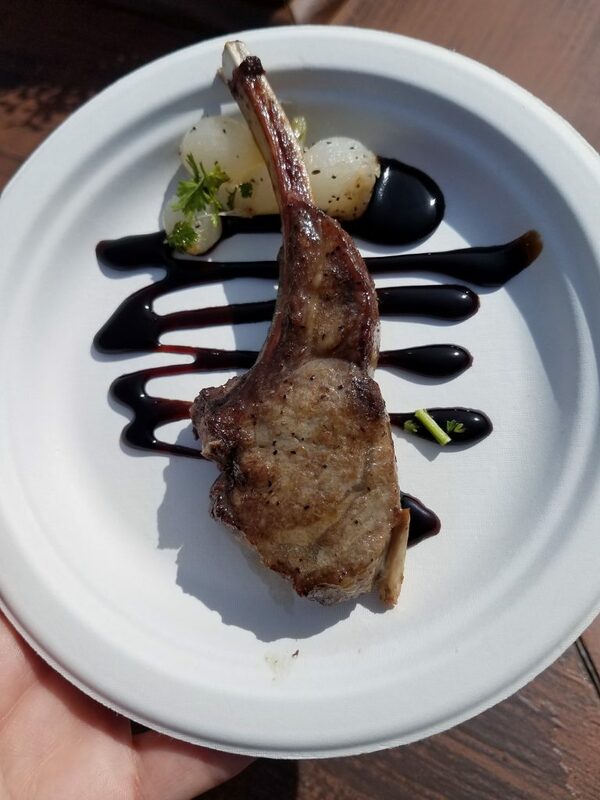 So, I wondered, how would the quick service-style food at the SeaWorld Seven Seas Food Festival stand up? It does not disappoint! The fresh cuisine is what you’d expect from a high-end San Diego restaurant. Certainly the higher prices reflect that, but it’s lovely to be able to dine well and not just have pizza or hot dogs as your dining option. 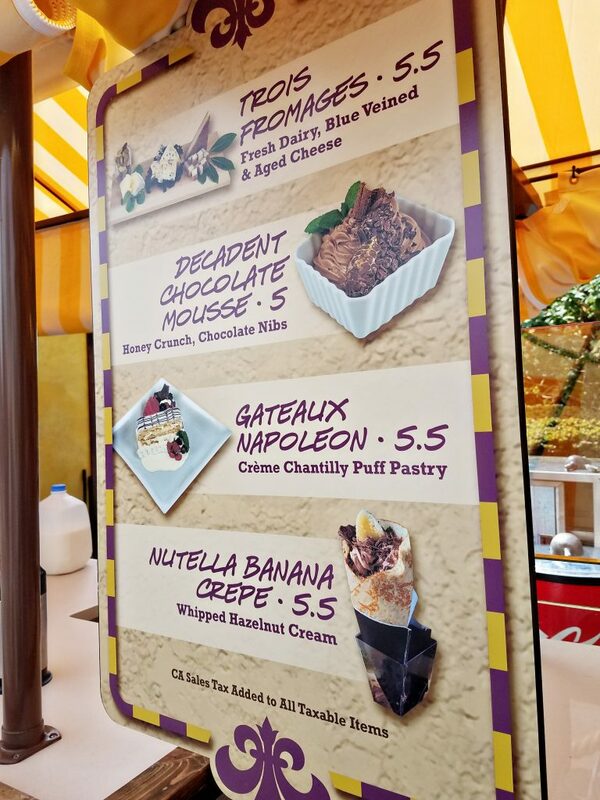 I mean, how often do you see duck confit, lamb sliders or Peruvian ceviche on an amusement park menu? Read More: 50 Free Things to Do with Kids in San Diego! 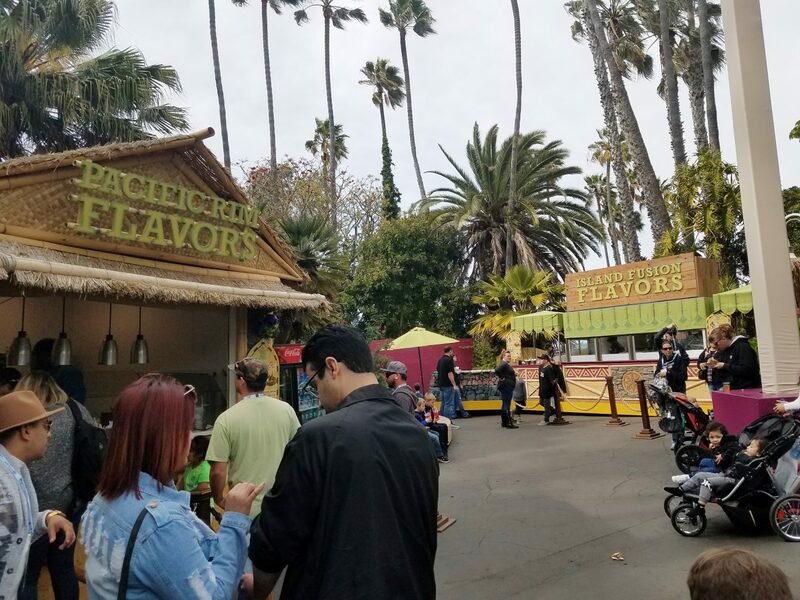 While SeaWorld may open earlier, the Festival food and dining kiosks don’t start serving until 11 am. Each kiosk features a menu board that shows a photo and the price of each item if you want to purchase them without the sampler card. Generally, each item costs around $5-6 if you buy them separately. With the 10-item sampler card, you’ll pay $5 per item. The 15-item sampler card is the best value, with each item costing $4.33. Food is almost always prepared to order at each location. It can take a few minutes to get your order because it’s being made fresh. The longest I waited for a dish to finish cooking was 10 minutes. Offerings include vegetarian dishes, non-alcoholic beverages and food that kids will enjoy. 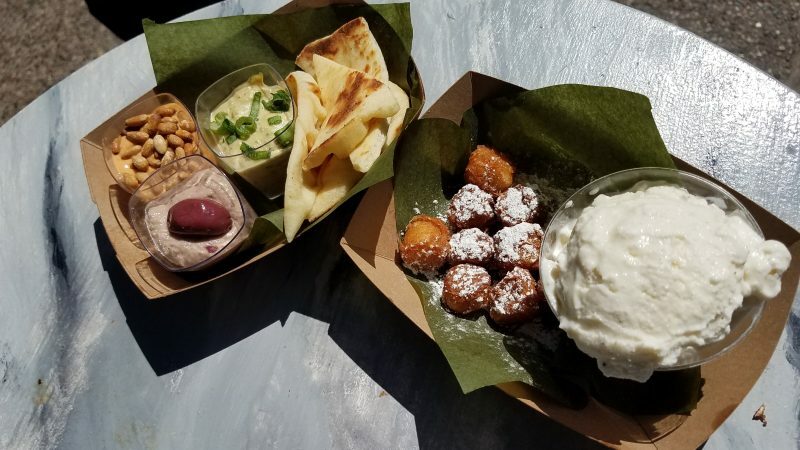 Anyone with a food allergy should probably skip the festival foods and dine only at Calypso Bay Smokehouse, a designated dining location for those with food allergies. Some locations are standing-room only, with tall tables. Others have tables in the shade. All of the usual SeaWorld shows and rides are open during the SeaWorld San Diego Food Festival. Find out more about SeaWorld in this helpful family guide. After purchasing your sampler lanyard, swing over to the SoCal Flavors and Stage. There are games for kids, a small entertainment stage and lots of shaded seating at picnic tables and on the faux lawn. Local San Diego artists play a wide variety of music throughout the festival. 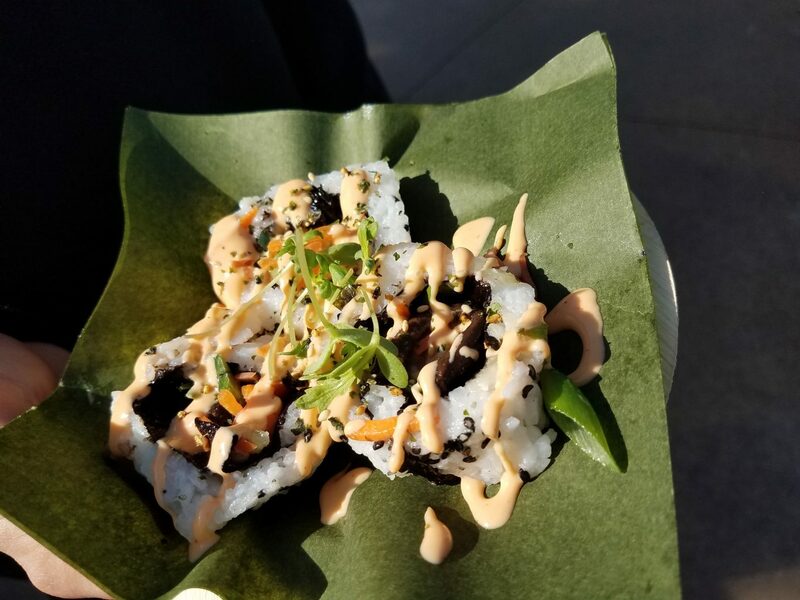 The SoCal Flavors area features three dining kiosks: Pretzel Flavors, Bacon Flavors and Hand-Rolled Sushi and Sake Flavors. There is also a Craft Beer Hub. If local craft beer isn’t your thing, check out the SoCal Wine Hub for a wine tasting, where you also can buy bottles of wine. My preschooler and I shared the amazing mac and cheese. It’s a small serving that packs a flavorful punch! 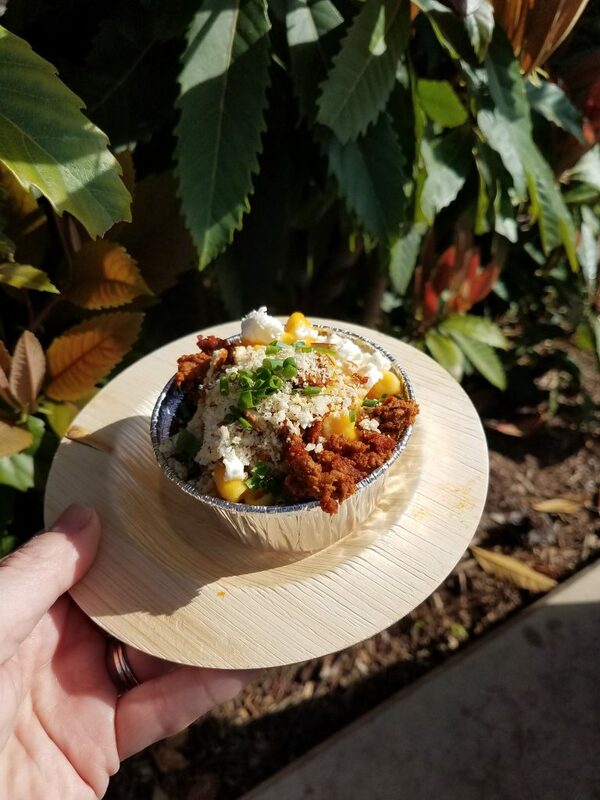 The mac and cheese is served with chorizo, panela cheese, green onions and pretzel crumbs. I might have gotten two bites before my daughter commandeered it as her own. This location was definitely one of my favorites (hello, bacon!). 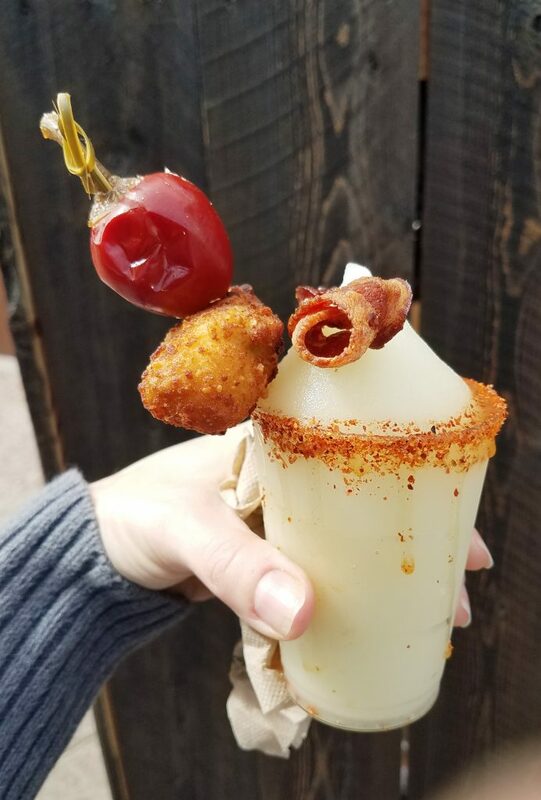 The margarita has a salty-spicy rim of Tajin and is served with a slice of crispy bacon, jalapeno popper and a pepper. 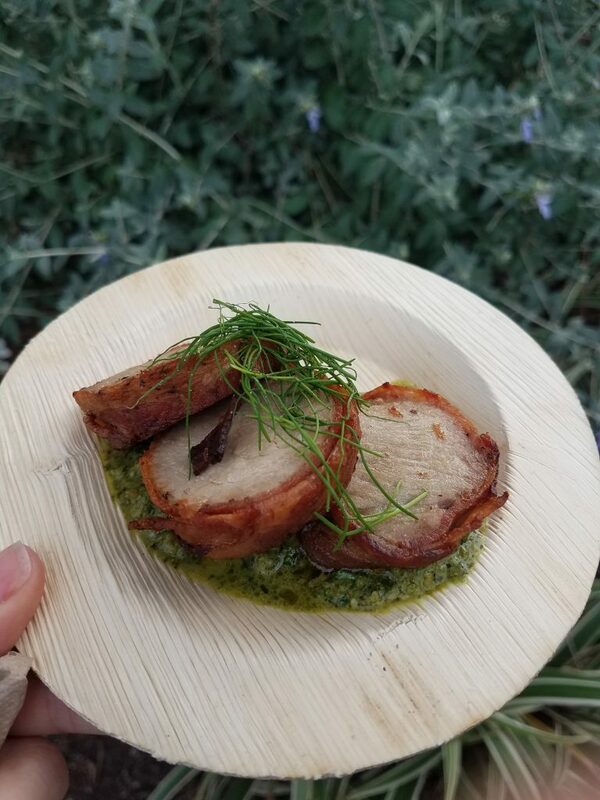 My family loved the bacon-wrapped pork tenders served with an herbed soffrito sauce then topped with micro chives. The buttery pork belly calzone was stuffed with meat. This was one of the best valued items at the Festival based on its size and high-quality. For my seafood-loving teenage son, this location was his absolute favorite of the Seven Seas Festival! He indulged in two plates of the dynamite roll (which he called “BOMB”) and also enjoyed the tamaki. His only complaint: The design made it a challenge to eat with his braces. Located next to the SeaWorld Manta roller coaster, this festival area is decorated with colorful paper flags. A craft beer hub is located in this area as well and we had the chance to chat with the brew master for Iron Fist Brewing Company. There are also plenty of places to stand or sit down at a table. SeaWorld only serves sustainable seafood, which my fisherman husband appreciates. 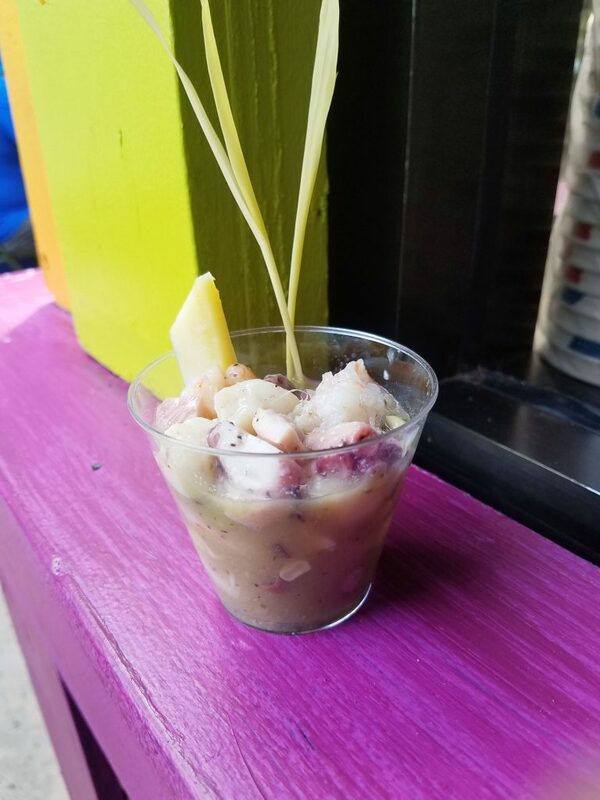 My husband and son shared the ceviche, which was filled to the top with octopus and scallops. They both enjoyed this Peruvian dish very much. 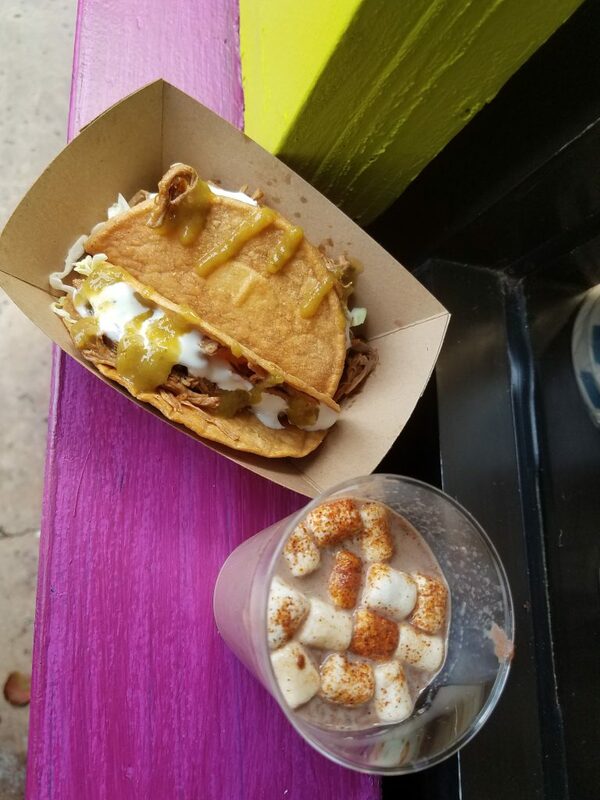 I shared the two crispy beef tacos, which had a spicy kick of jalapeno pepper jelly crema. One of the surprises of the festival was the Oaxaca chocolate. It’s a tiny cup of warm chocolate that’s topped with chili-dusted marshmallows. Perhaps not one of the better uses of your sampler options since it’s very small, but it was delicious! Set behind the Manta coaster are the three Polynesian dining and drink kiosks and entertainment stage. 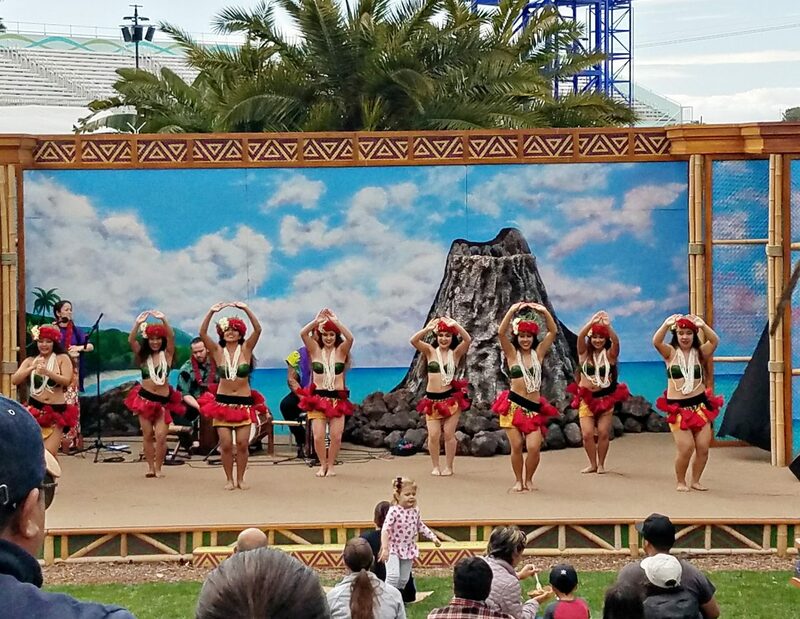 Authentic Polynesian dancers take the stage here, including sizzling fire dancers each night in a can’t-miss show. There are chairs set up on the lawn and plenty of standing room so you can grab a dish and sip a fruity drink while you watch. Somehow I missed getting myself a drink here. My two boys each got a Tiki Punch which tasted a bit like traditional Hawaiian Punch to me! The kiosks in this area are set up around the corner and tucked away from the pathway. It was a bit congested with guests waiting for their orders. 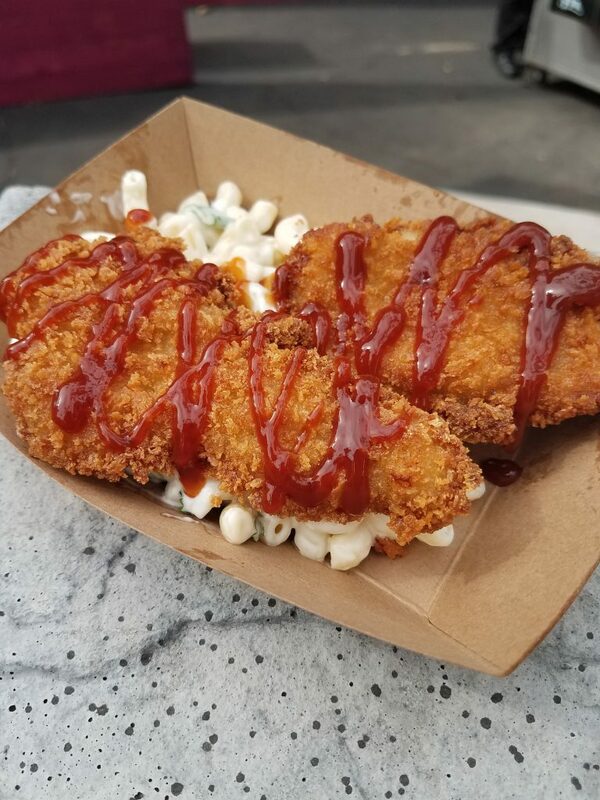 My husband enjoyed the chicken katsu with macaroni salad and a “Coke sauce” drizzle. I liked the rainbow of fruit served with a crispy pastry crust. Didn’t look at all like the photo on the menu but delicious and refreshing nonetheless! We didn’t get a chance to eat here, which was disappointing because the rum-whip roulade dessert looked delicious! This quiet location is tucked away from the path but don’t miss it! There is a shaded patio area so you can sit back with your drink and dish. Colorful tomatoes covered the bruschetta, to the delight of my veggie-loving preschooler. 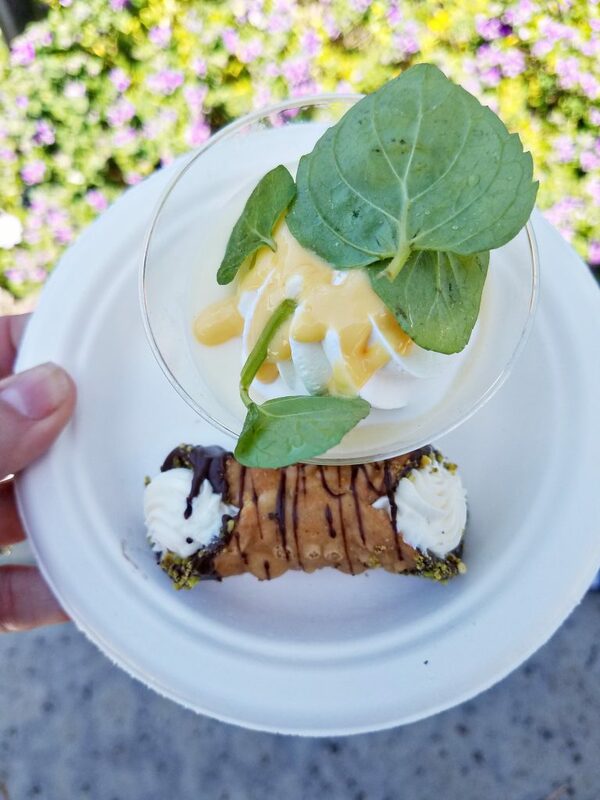 And of course she split the dessert dish with me, taking over the rich panna cotta while I devoured the cannoli. This popular location is on the path behind the Nautilus Amphitheatre. Standing at a pillar table while you eat and drink is the only option here. 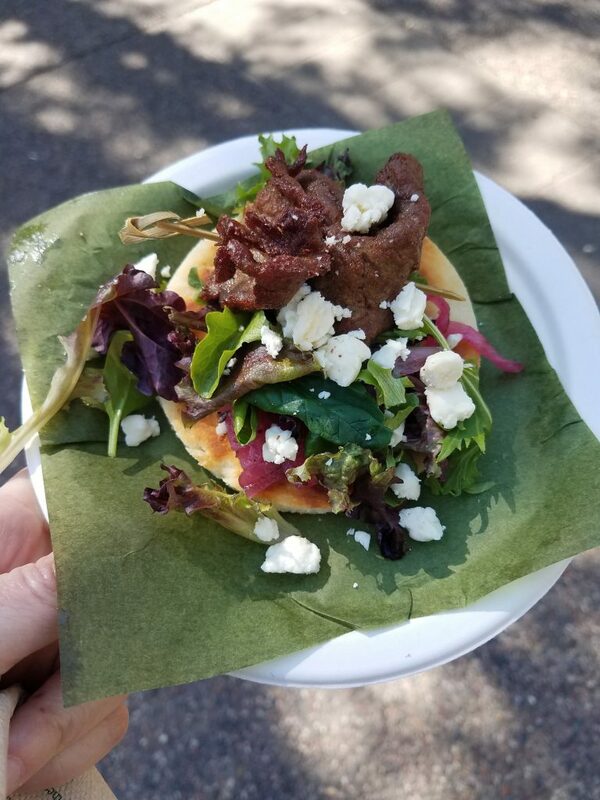 I was glad to see that the lamb slider has returned to the Seven Seas Festival. It is quite yummy, with a buttery bun and shaved cucumber mint yogurt sauce. The hummus is another delicious dish (but my family wanted more bread!). The kebab is a larger dish rounded out with warmed flat bread and pickled onions. We didn’t have any problems polishing off the dessert beignets. 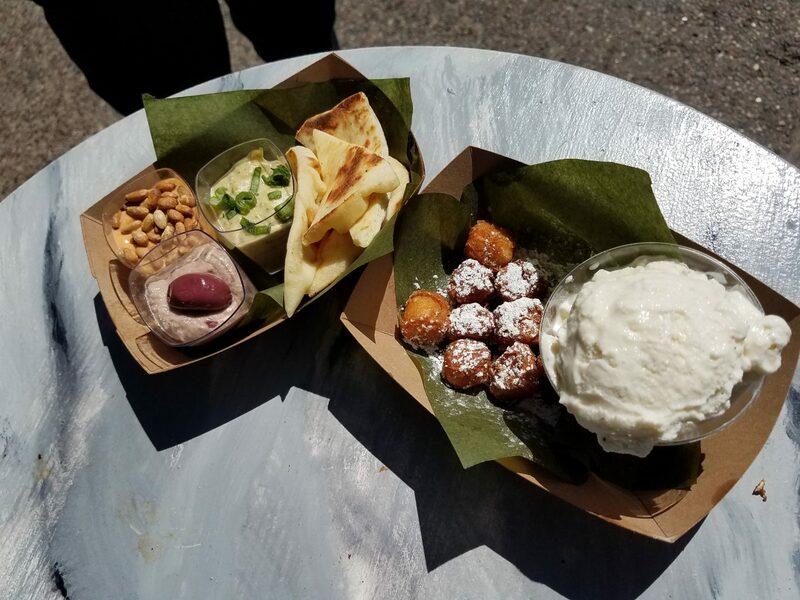 Despite the tiny size of the beignets the Madagascar vanilla ice cream serving was large and my younger kids shared it. 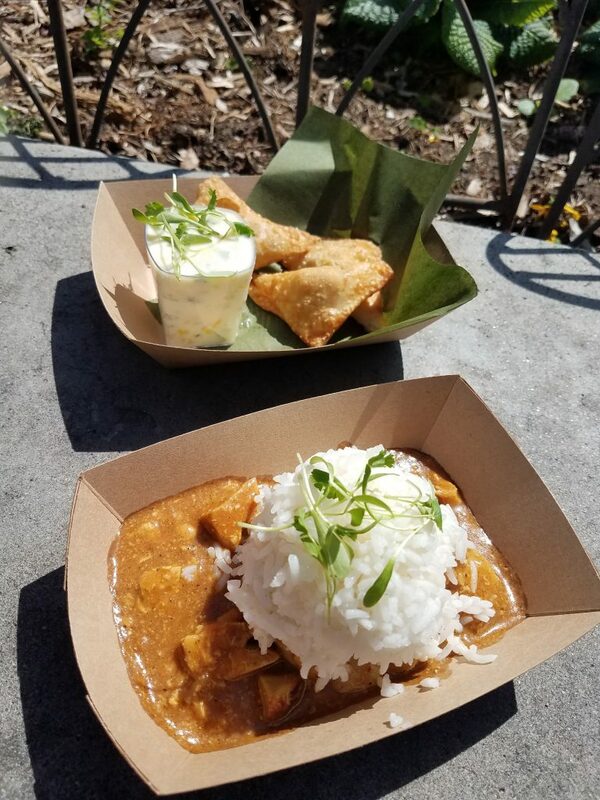 New to the SeaWorld Festival in 2019, these spicy and flavorful dishes are rich and hearty. The tikka masala was a large portion that my teenager and I shared. The samosas were perfectly stuffed and crispy on the outside but I didn’t care for the dipping accompaniment. One of the largest and most popular locations features sophisticated French dishes and desserts. This area also features live music on the French Flavors stage. The tunes are decidedly Parisian, with accents of accordion and strings. There is another craft beer hub and also a Starbucks located here for anyone who needs a caffeine boost! 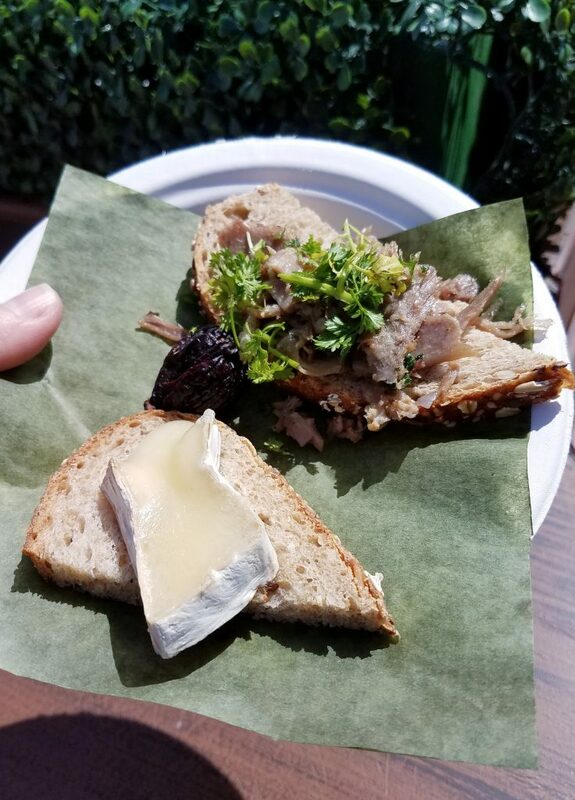 While my husband grabbed Stone Brewing Company beer tastings from the craft beer hub, my teenager and I snacked on the amazing duck and brie combo. 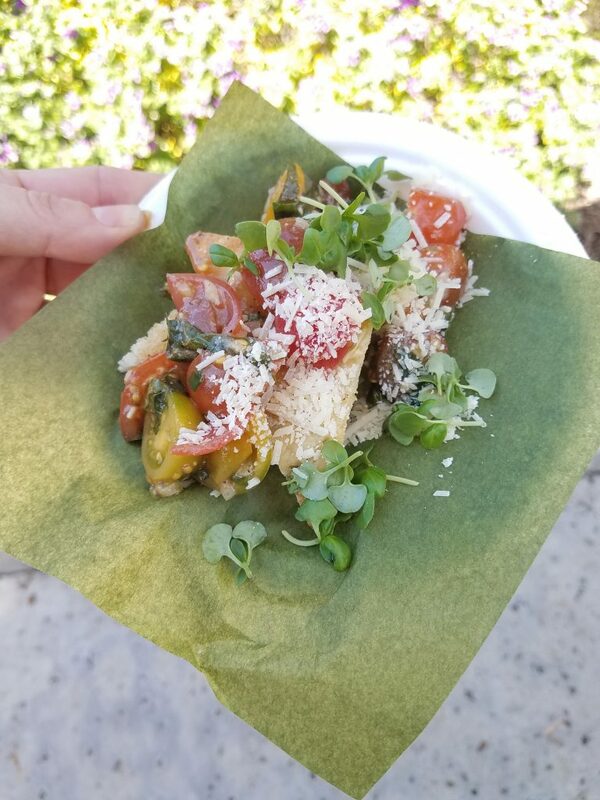 This was definitely one of the fancier dishes served during the SeaWorld festival and it did not disappoint! While the French appetizers were a very good value, some of the desserts are small. The mousse was a rich and tasty dessert, albeit only about 5 spoonfuls. 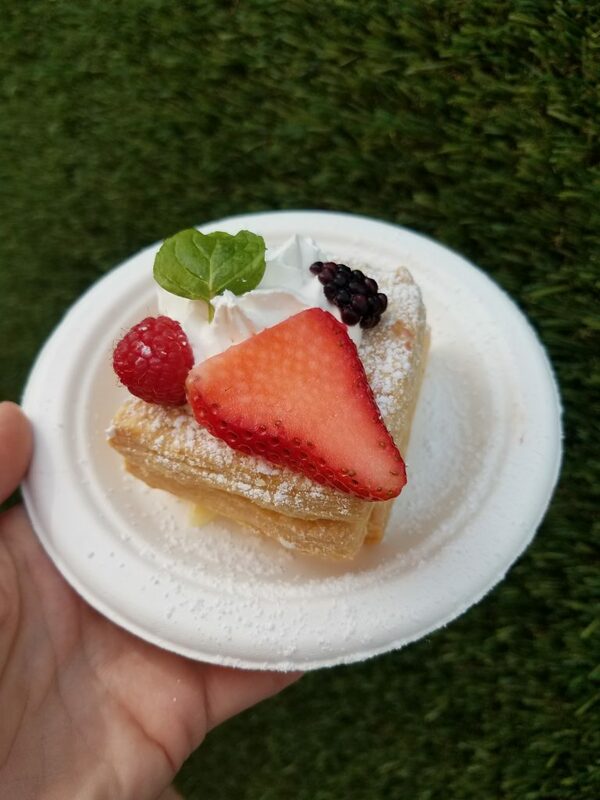 The napoleon was a challenge to eat, with crispy pastry layers. We skipped the forks and picked up the creme chantilly coated pieces to eat them with our fingers. 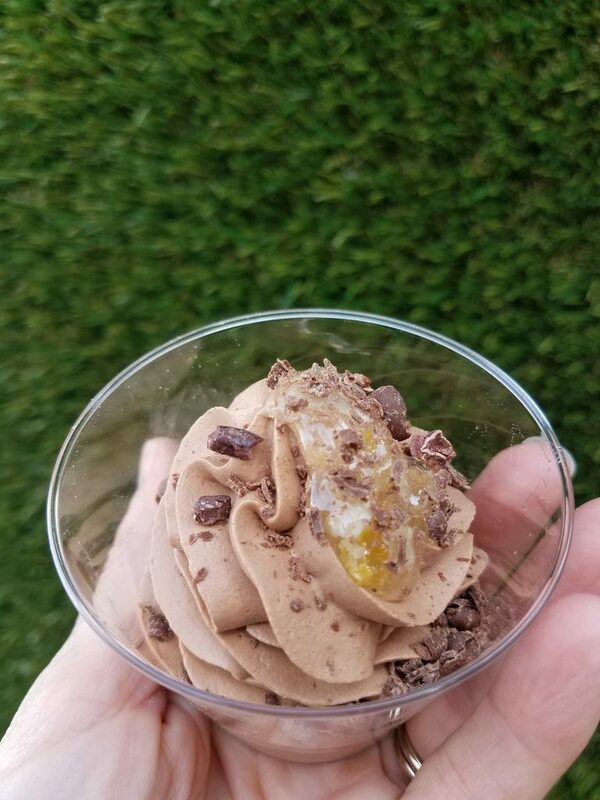 This yummy dessert was the perfect closer to our Seven Seas Food Festival excursion. 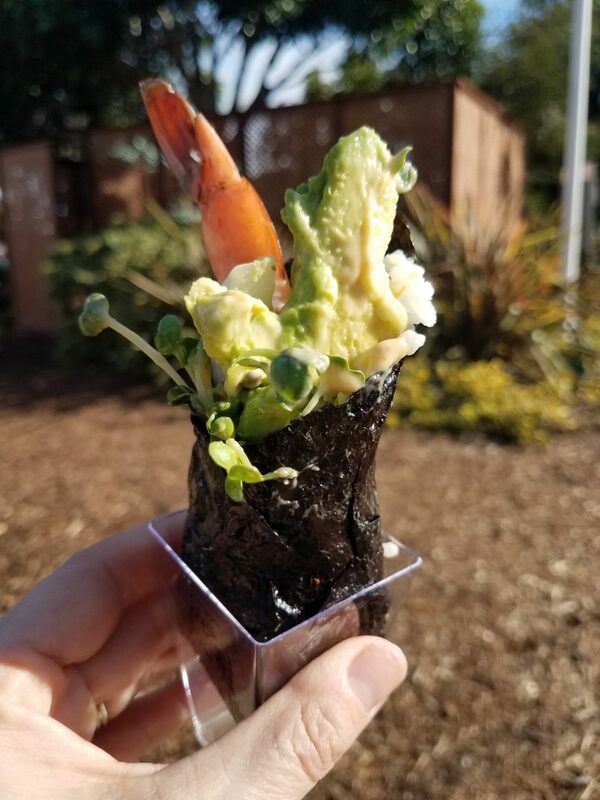 After viewing the images of the foods online, I had my doubts that these ambitious dishes would look even remotely like the high-end appetizers in the photographs. Amazingly, each dish we received was perfectly prepared. Some of the photos don’t always look exactly like what you receive, but they are pretty close. 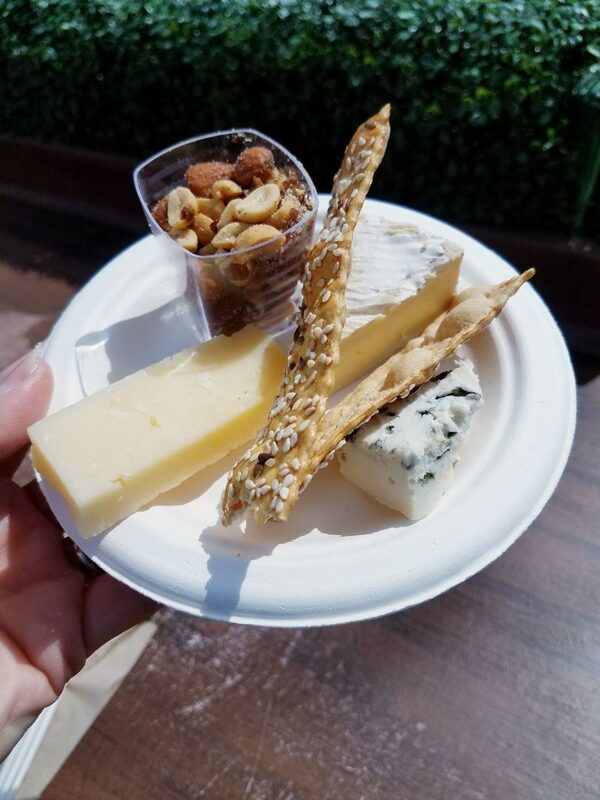 The entire experience was well executed and I’m happy to see how the SeaWorld San Diego’s food festival has grown over the years. We had a delightful (and delicious) time sailing the Seven Seas with SeaWorld. READ MORE: Visiting SeaWorld San Diego in the fall? Find out more about the Halloween Spooktacular special event! Then return in the winter for the SeaWorld Christmas Celebration.